Following traditional best practice, I sculpt the Cracker Packer figures unclothed first. Why? If you think about the clothes you are wearing now, where do your clothes touch your body? Our bodies shape the clothing we wear rather than the other way around. Some think that this is a waste of time. But for a figure to look convincing, it must look like there is a human – an anatomically convincing human – underneath the clothing. This is the only way I know how to achieve it. So, yes, it takes up much more time and the model’s time is expensive. But I wouldn’t do it any other way. No 3-D scanning of the model for me, thank you. 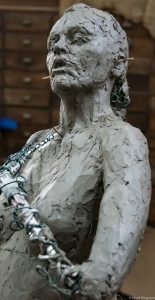 I would miss the most joyful part of the process – working with the clay, with the model. I have many sittings with Sandra, Jenni and Rosie – with Rosie wearing the corset so I could get that distinctive shape required for the early 1900s. Even women factory workers wore corsets. Most nights I also wheel the two figures together to check the overall pose is working – of them in the full flow of story-telling and happy chatter. It’s important to keep the clay in good condition, meaning quite moist. Throughout the day I spray the figures with water. Each night I dampen cotton rags and cover areas vulnerable to drying-out, before covering the figures in two layers of polythene sheeting. When I am almost happy with the unclothed figure, in comes the official photographer. I’m lucky that Carlisle City Council has appointed Nigel Kingston to take photos in my studio during the clay build of the Cracker Packers. Most of the photos on this page are by the talented Nigel.